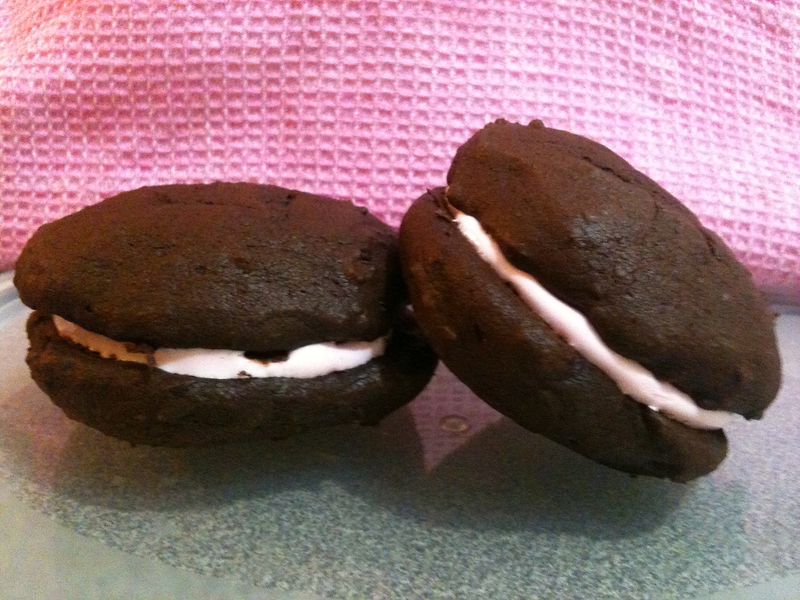 Sia's Cooking Blog: Chocolate Whoopie Pies the New Sensation! Chocolate Whoopie Pies the New Sensation! I think like most of us the first time we heard about Whoopies Pies was on Masterchef a few weeks ago when Dani came across them in New York. I found this Chocolate Whoopie Pie recipe online but changed a few ingredients for those of us who are lactose intolerant. You will find this one easy on the stomach and delicious to eat. I offered these to friends last night when they were over and was delighted to find one friend came back for thirds! Sift the flour, cocoa, baking powder and bicarbonate of soda into a bowl. Beat the butter and sugar in an electric mixer until light and fluffy. Beat in the egg, followed by the vanilla and milk. Next add dry ingredients and beat until combined. Place tablespoonfuls of mixture a few centremeters apart on the trays. Bake for 9-10 minutes until doubled in size and firm on top when gently pressed. Transfer to cooling rack. Place marshmallows and 1 teaspoon warm water in a microwave-safe bowl and microwave on high for 20 seconds then stir until smooth. Once the mixture has cooled slightly spread it over half the rounds then sandwich them together.